Group tailgate spaces are located at the north end of the bus lot, across from pier 48, accessed via Terry Francois Blvd. and Mission Rock St. intersection. Ideal for a pre-game family BBQ or a company outing of several hundred guests and located conveniently near the bus parking area. Please contact your Account Manager if you are a returning Group Leader at 415.972.2299 or Giants Sales Executive at 415.972.2298 to make tailgate reservations. Giants tailgate lots open 4 hours prior to game time for caterers and set-up. Tailgaters allowed access 3 hours prior to game time. Each group tailgate space can accommodate up to 100 guests. 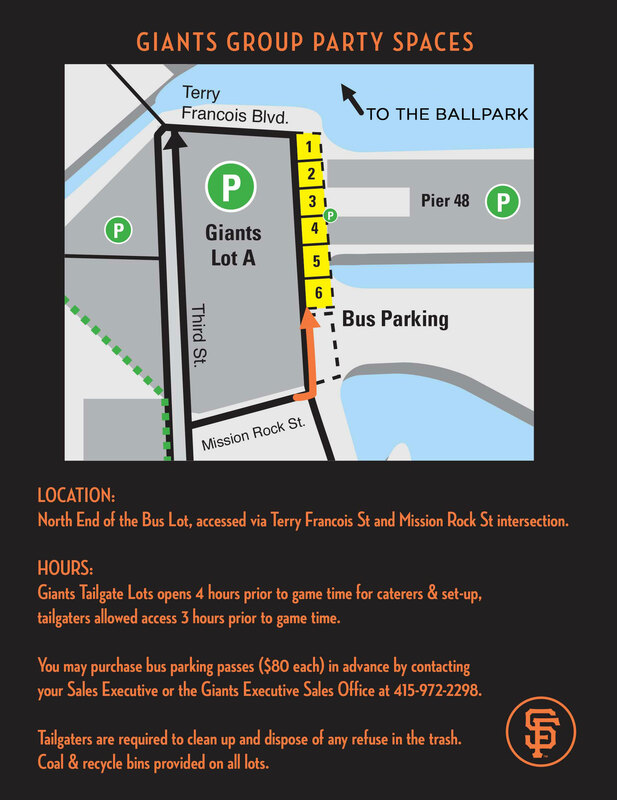 After you have purchased your tailgate space(s) your Giants Sales Executive will issue you two parking passes that will allow two catering vehicles or two cars to park in each tailgate area. Additional parking passes may be purchased on the day of the game. Tailgaters are required to clean up and dispose of any refuse. Trash, coal and recycle bins provided in all lots. Please note that buses are not permitted in Giants tailgate lots. Buses may drop off tailgaters in front of the tailgate lots and then proceed to the bus lot adjacent to Giants Lot A. Bus parking is $80 and may be paid at the entrance of the bus parking lot. You may also purchase bus parking passes from your Giants Sales Executive. Please review the fire safety requirements for group tailgate spaces. Upon purchase of a tailgate space you will be asked to return a signed acknowledgement of these safety regulations. Fire and water extinguishers will be provided in all tailgate spaces.